The charming neighborhood of Decatur is just six miles east of downtown Atlanta. Friendly, walkable and right on the MARTA east-west line, this community is home to more than 200 boutiques, restaurants and galleries. Morning: Start off the day with coffee and a donut from Revolution Donuts. Revolution offers a variety of homemade, all-natural pastries like the peach slider which consists of slices of local Georgia peaches between a sliced, round donut. Act quickly as this fruity treat sells out fast. After breakfast, head to the historic downtown Decatur Square for shopping at the many boutiques, galleries, record stores and bookshops. 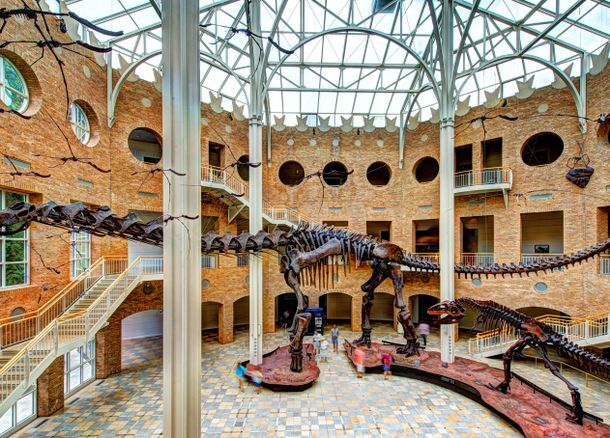 Afternoon: From the largest dinosaurs ever discovered to the biggest movie screen in town, Fernbank Museum of Natural History offers a world of adventure. Immersive exhibits make science, culture and natural history come alive. Venture a little further east to take a glass-blowing class from the experts at Atlanta Hot Glass. Have fun with this hands-on experience creating a paperweight, vase or ornament. Lunch: Across the street from the Decatur MARTA station is Cakes & Ale from James Beard Award semifinalist Billy Allin. The restaurant offers a twist on traditional Southern snacks, plates and sandwiches with offerings like pimento cheese with fried onion rings with a side of sweet potato chips. Dinner: Reflecting the style and character of Decatur, Kimball House has an ever-changing menu and raw bar in a converted train station. Southern Living named it one of the best new restaurants with offerings that includes fish, beef and vegetable plates that change with the seasons. After dinner, enjoy live music at Eddie’s Attic, where musicians have found a following for more than 20 years. Visit Atlanta.net/explore/neighborhoods/nearby/decatur to learn more about Dectur and Atlanta’s other diverse neighborhoods.